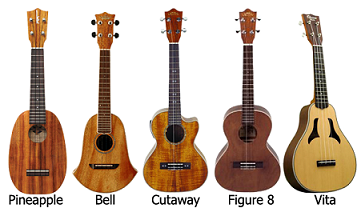 Every ukulele has 6 parts: strings, body, sound hole, frets, neck, and tuning pegs. Ukulele's have 4 strings: G, C, E, and A. The lower strings are located in the middle and the higher strings are located on the outside. The soprano ukulele has the highest sound. It has the same notes, just octaves higher. The concert ukulele has a soother sound used to blend in when in a concert setting. It usually has a clearer sound. The tenor ukulele is bigger and produces a warm tone. It has a normal octave for a pitch. The baritone ukulele has a lower, louder, and lovely sound. It can sometimes get confused with a guitar because of sound and the size. 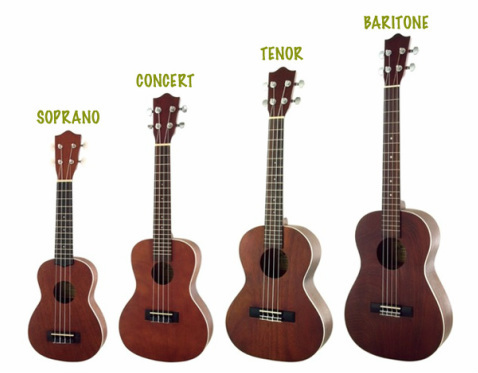 The baritone is obviously the largest ukulele. For the most part, the shape does not change the sound and the tone of the pitch. The most common shape for a ukulele is the Figure 8. The Figure 8 and the Cutaway are normally the easiest to handle.